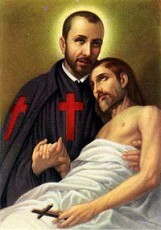 St. Camillus de Lellis was an Italian Priest who founded a religious Order dedicated to caring for the sick. He was born in 1550 in Naples. His mother was nearly sixty years old when she gave birth to him, and his father was an officer in the army and was seldom home. His mom died when he was 13, and family members took him in after her death. At seventeen, he joined his father in the Venetian army and fought in a war against the Turks. After several years of military service, his regiment was disbanded and he worked as a laborer at the Capuchin Friary. He was constantly plagued, however, by a leg wound he received in the army, which would not heal. Despite his aggressive nature and excessive gambling, the guardian of the Friary saw a better side to his nature and worked hard to bring that out of him. Eventually the guard’s kind and gentle nature penetrated his heart, and he entered the novitiate of the Capuchin Friars at the age of 25. Due to his leg wound continuing to plague him, he was denied admission to that Order, as physicians declared his leg incurable. With that being the case he moved to Rome and entered the Hospital of St. James, which cared for incurable cases. He became a caregiver at the hospital, and later it’s Director. All of this time, he continued to follow a strict ascetic life performing many penances, such as a constant wearing of a hair shirt. He took on as his Spiritual Director and Confessor, the popular local Priest of the time, St. Philip Neri. He began to see the poor attention the sick received from the staff of the hospital, and was led to invite a group of pious men to express their faith through the care of patients at that hospital. Finally he felt called to establish a religious community for this purpose. St. Philip Neri his confessor gave him approval for this endeavor, and a wealthy donor provided him with the income necessary to undertake his seminary studies. He was ordained a Priest on Pentecost Sunday, at the age of 34 by the Bishop of Wales, ironically the last surviving Catholic Bishop of Great Britain. Eventually he and his companions moved to the Hospital of the Holy Ghost and assumed responsibilities for the care of patients there. He founded the Order of Clerks Regular, Ministers to the Sick, better known today as the Camillians. The large red cross on their cassock’s remain a symbol of the Congregation today. This was the “Original” Red Cross, hundreds of years before the International Red Cross Organization was formed. Pope Gregory XV was so impressed with his great works he elevated his Congregation to the status of an Order in 1591. Throughout his life his ailments caused him suffering, but he allowed no one to wait on him, and would crawl to visit the sick when unable to stand or walk. He possessed the gifts of healing and prophecy, and remained Superior General of the Order until he was 57, and then Vicar General. By that time, communities of that Order had spread all throughout Italy, and as far as Hungary. While touring for an inspection of all the hospitals in his Order, he fell ill. He died in Rome in 1614, and was entombed at the Church of St. Mary Magdalene. St. Camillus de Lellis shows us that a true conversion is possible. He was a wild, aggressive, excessive gambler – that had a true conversion. He spent the rest of his life using his gifts to care for the sick, even forming a religious Order. His great works up until 1614 was the original Red Cross, hundreds of years before the International Red Cross Organization was founded. Because of St. Camillus, we have the International Red Cross today. His life shows us that it doesn’t matter what we are doing now, or where we are at on our faith journey, it is never too late to have a conversion and fully embrace our faith in serving others.